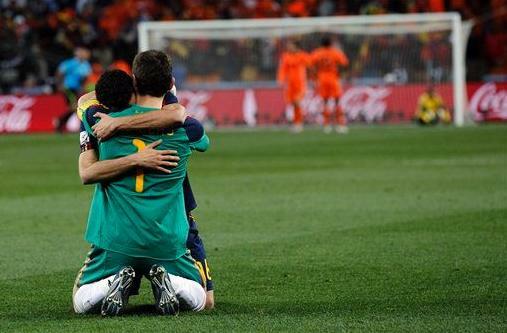 Spain defeated the Netherlands, 1-0 in extra time, to capture their first ever World Cup. It’s a great day for Spain, South Africa, and soccer fans everywhere. Well, except in the Netherlands. It’s THE NETHERLANDS. Not Holland. Period. The dives were ridiculous, as were the number of cards. The ref got too caught up in the game, and started handing out cards for every foul. 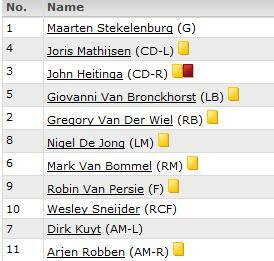 There were only three Netherlands starters who weren’t booked, one of which being the goalie. The Netherlands really should have won the game in regulation. Robben had numerous chances that he didn’t finish, and the Dutch collectively had poor execution on odd-man chances and breakaways. I know soccer commentators during the tournament weren’t exactly known for their energy, but the ones during the game were reallllyy boring. Given the magnitude of the game, I would have liked them to be more animated and made the chances seem like bigger deals. It’s the World Cup final, wake up. I am glad though that someone scored and the game didn’t have to be decided by penalty kicks. Yes, they’re exciting, but that’s not the way to lose the World Cup. I’d be in favor of, for the semifinals and championships, adding an additional 20 minute session (two 10 minute halves) and giving each team one more sub. Coming into this World Cup, only seven countries had won the tournament. I found this graphic online, which illustrates the number of cups per country. If you asked me, I could have named all of them, but seeing them laid out like this was an eye-opener. For those of you who are geographically challenged, it’s Brazil, Italy, Germany, Argentina, Uruguay, France, and England (and now Spain). There will be people who complain how low scoring the game is, but I always argue back that it should be fun to watch because there is constant action. People say they like watching hockey but not baseball because of the difference in game speed, but really, soccer should be the easiest to watch. Constant gameplay, no timeouts, no commercials, no coaches challenges, no measuring for first downs, no pucks out of play, and definitely no switching pitchers after one batter. Just action, action, action. After this showing from Team USA, they really need to go at least as far as they did this time for the next one to be considered a success. As mentioned before, soccer in this country can not afford to have the States eliminated in the group stage. That’s all she wrote, folks. Congratulations to Spain for winning their first ever World Cup, and for becoming the first team to lose their opening match and then go on to win it all. Soccer doesn’t stop for four years, though. You can tune into the Fox Soccer Channel for some English soccer, or check out the MLS for America’s pro league. Locally, you can get out to watch FC Buffalo play (or catch their final home game in about 90 minutes at All-High Stadium). Knock the ball around with friends or get a game of World Cup together with the guys. This may be my last soccer post for a while, but that doesn’t mean the sport stops until the world reconvenes in Brazil, just over 1400 days away. The U.S. Men play Brazil in New Jersey, Tuesday August 10 at 8pm. It’ll be live on ESPN2, or catch the game.